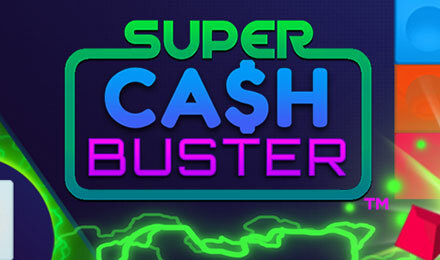 Get blasting the vibrant blocks on Super Cash Buster slots at Moon Games. Find hidden rewards under the block and get even more by collecting them. Super Cash Buster is an Instant Win Game which is just as rewarding and colourful as it’s big brother, Cash Buster. When playing, all you must do is select your bet and press play. You’ll be granted 8 rolls. Every time you roll the dice the result will be a colour; the colour represents the blocks that will be destroyed in the Cash Buster Zone. The amount of blocks that are destroyed in the Cash Buster Zone is the same amount that will fill up in the prize table. If you manage to fill up any of the slots on the table, the prize is all yours!